﻿ What equipment is needed to trap a skunk? Getting a skunk to enter a trap isn’t as difficult as many would assume. You will need to lure the animal into a cage. Skunks eat a wide range of foods. The greatest difficulty that you can face when you are dealing with a skunk is avoiding the spray that it can give so willingly. Getting the stench off can be really difficult. Always avoid handling the animal with your bare hands. 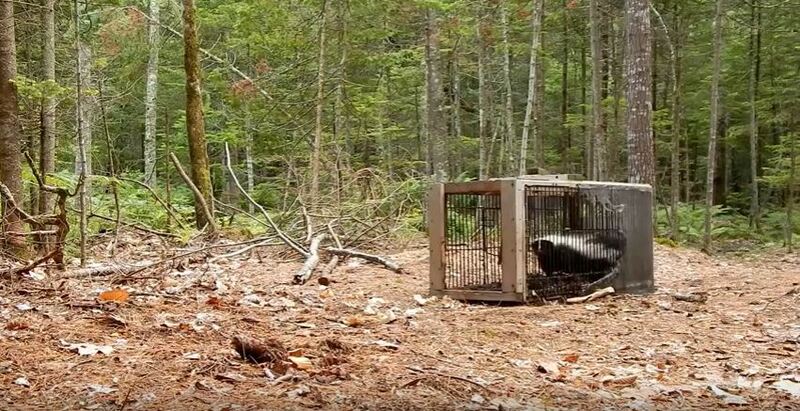 In the case of a cage trap, it is very easy for the skunk to spray through it, and this is why so many people prefer the use of traps that are solid walled and spray proof kind of traps. When you have a skilled wildlife trapper, you will not have to worry about the spraying as they know how to go about the entire exercise. It is important that you approach the animal with great caution. You should also be aware of all the signs that you should look out for. Usually, the skunk will behave in a certain way before spraying. If it seems agitated, is stamping its front paws, and then turns and lifts the tail, you need to get as far away as possible. You should always approach the animal in a way that is non-threatening and not alarming so as to ensure it stays as calm as possible. Before you handle the cage after the animal has been trapped, you can use a towel or any kind of cloth to cover the cage as you start transporting it. If travelling by car, make sure you use a pickup truck and place it at the back. Even though the skunk may not spray within the car, it can still do so without warning. Bait is very important when it comes to trapping a skunk. Marshmallows work well and they will not usually attract the stray cats within the neighborhood. If there isn’t a cat problem in your area, you can use dry or wet cat food as it can work well with the skunks. If you aren’t too sure about what you are supposed to do to successfully trap the animal, you need to find a professional who will be willing to help. Go back to the How to Get Rid of Skunks page or email us if you have any other questions about What equipment is needed to trap a skunk?